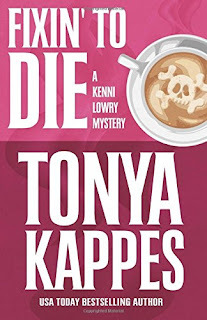 I have been a fan of Tonya Kappes and her offbeat paranormal mysteries for a while now, so I was excited to see a new series coming out. 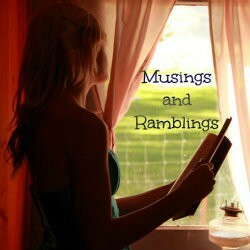 This is an author who does a wonderful job with slightly offbeat, yet incredibly down to earth characters. Plus she totally has the unique southern small town vibe nailed down. Even though there is some form of paranormal going on, she makes them seem almost believable. It's one of the reason I keep going back to her work. Which is why it pains me so, that I had a hard time getting into the beginning of this book. It just wasn't flowing for me. It wasn't until well into chapter 6 (about 25%) that I really became engrossed and fully committed to the book. I'm hoping it was the fact that we spent most of that time going around the town and getting to know it's inhabitants, and basically laying most of the groundwork. I just wasn't sure if I was going to like Kenni or not. It took a bit for me to really warm up to her. In the end, I was elated to see that I had figured out who the bad guy was. I didn't have the motive, but that was a tricksy surprise that Kenni didn't figure out either, until the big reveal. Overall, I did enjoy this book and happily look forward to the next Kenni Lowry book. I gave this book 3 stars. “Aren’t you ordering?” he asked. “She knows what I want.” I waited patiently but my taste buds were already oozing. “Sunny Goose Sammy for you.” Jolee put my usual in a paper carton on top of the counter, a cup of coffee next to it. “And a Yankee sandwich for you.” She sat Finn’s plain turkey sandwich next to mine. “You didn’t order a Coke.” Jolee was getting a little feisty. “Right, I’m ordering a Pepsi…” he said, trying to figure her out. “That’s fine,” Finn stuttered, not knowing how to handle Jolee. Netgalley and Henery Press provided me with this book in exchange for my honest opinion. Kenni Lowry likes to think the zero crime rate in Cottonwood, Kentucky is due to her being sheriff, but she quickly discovers the ghost of her grandfather, the town’s previous sheriff, has been scaring off any would-be criminals since she was elected. When the town’s most beloved doctor is found murdered on the very same day as a jewelry store robbery, and a mysterious symbol ties the crime scenes together, Kenni must satisfy her hankerin’ for justice by nabbing the culprits. With the help of her Poppa, a lone deputy, and an annoyingly cute, too-big-for-his-britches State Reserve officer, Kenni must solve both cases and prove to the whole town, and herself, that she’s worth her salt before time runs out.